The village of Montecastelli was built in the 13th century. Its characteristic houses made of local stones give it a particular atmosphere. Encircled by fine woodlands, hills and meadows. The valley is home to a wide variety of animals, birds, butterflies and rare wild plants: snowdrops, hellebore, anemone, narcissus, cyclamen, wild orchids, primrose, brooms, wild cherry trees and arbutus unedo to name just a few. This apartment has been meticulously restored by the current owner, the magnificent light-filled salon, with its pastoral and trompe l'oeil murals covering all the walls, is furnished in comfortable Tuscan style, with period furniture. The bedroom, with double bed and period furniture, has had its original wall painting restored; and the kitchen is a perfect mixture of ancient style with full modern convenience. The apartment is approached through a private and secluded garden, with a pergola-shaded terrace, where you can relax and eat. 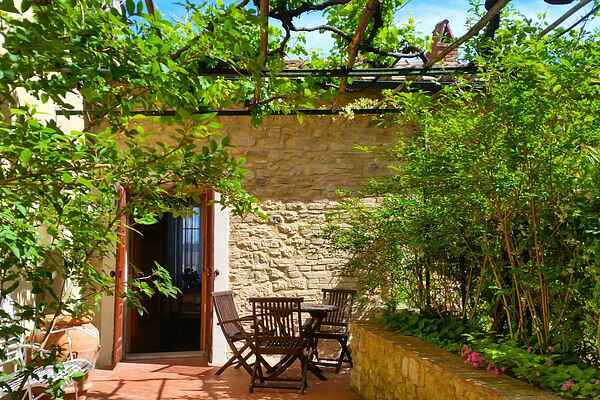 From the windows you can see the tuscan hills, this is a perfect spot to enjoy the proximity of the larger centres of entertainment and culture which the area offers. Montecastelli lies 2km from the Peacock River (Pavone) where it is possible to bath, to swim, to make long walks in a wonderful canyon until you reach the confluence with the Cecina River. In case of health problems an English speaking family doctor is nearby.